This is my first garden & I've been attacked by the Squash Vine Borer . I recently purchased BT and tried to wrap the stem in foil earlier, but I think they were already in the plant before I wrapped them. I went out this morning to spray BT & pulled back the foil & found a dead borer. I don't know if it died because of the foil or the BT. The plant looks healthy on top, but has suffered damage on the stem, can I save it or should I start over? If your plants aren't wilting then they'll keep producing! Just keep doing what you're doing! I've seen plants with borers in them still putting out fruit. Leaf droop is common in the heat, but the plants revive in the evening. If they are not reviving, then it's prolly too late. Female flowers aren't far behind the males! I'd bet you'll get something soon. 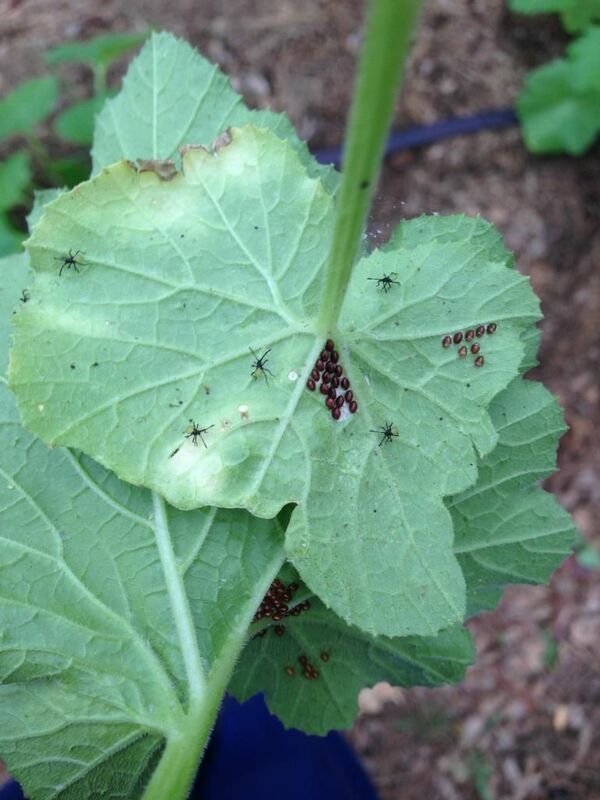 Btw....Look out for squash bugs! I found a BUNCH of eggs this afternoon. I found mamma right before the storm. Crush the eggs and mamma, or give the gwownups (kid called me that tonight!) the spa treatment. I find the highest number of squash bugs right after I water. Squash is the only plant in my garden that I top water, and it's for the sole purpose of squash bug hunting. These are the eggs (and nymphs) I found tonight! If you think you managed to kill the SVB in the stem, and you don't need access to the area any more, bury the stem all the way above the next leafnode. The squash will grow new roots above the break in the stem. It's also a good idea to bury leaf nodes along the vine here and there once the squash vine starts to run, so the plant can form secondary and tertiary -- satellite -- root systems. This way it won't be solely dependant on supply from the main root system. Thanks for the advice Lindsay. I need to check under the leaves more often. I spray neem oil under the leaves of all the plants about once a week, but haven't checked for squash bugs. I can't wait to see my first female flower.